When the Vicar of St Peter’s Church Mansfield asked me about a Crosti boliered 9F I leapt at the chance to build one for him. Golden Arrow Productions offers a resin body kit as well as the matching tender body. 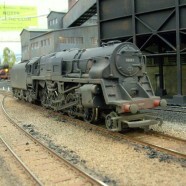 So in short order I had a resin kit for a “full” as built loco and a donor Triang/Hornby R550 9F from the eventual owner. The R550 is an old version dating from 1973 which has the original permanently coupled tender and Fleischmann derived “Silver Seal” tender drive that was to lead to a bit more work than if I’d gone with a later 9F. Starting with the tender, the castings cleaned up easily, one or two air bubbles to fill with model filler but nothing too onerous. A hole needed to be cut in the rear coal space to accommodate the higher tender drive unit that I was using and the large tender weight needed to be trimmed down at the top to take account of the thickness of the resin casting to ensure a snug fit on the original frame. Handrails were added by drilling small holes in the dimples provided and using some 0.5mm copper cable stripped from figure of eight “bell wire” suitably shaped and superglued in place. First issue with the bodyshell was that the casting has the blower duct/tunnel on the left hand side of the boiler that was only fitted to the rebuilt versions, this had to be carefully scraped off and made good using a sharp scalpel blade and fine grade wet or dry paper. Once this job was done the rest of the bodyshell was fettled and filed, this took quite a bit longer than the tender, but then it is a much more complicated casting. It cleaned up really easily and what initially looked like a bit of a challenge very quickly acquired the look of the prototype. The cab backhead and floor which is a separate casting was glued in place using epoxy resin then left overnight. Next the lower door and some of the other fittings were added. The front of the chassis needed filing back a bit to clear the lower door as per the instructions- only about 1mm and the standard body fixings still work after this modification. All the bits, once trimmed up, fitted really well together – no real hassles at all. One part that did need more fettling than the others was the blastpipe/steam pipe casting .15 minutes carving with a sharp knife with a good photo of the real thing to compare with and I was happy. Handrails, operating rods and other boiler fittings were fashioned from “bell wire”, a bass guitar string was employed to represent the lagged feed pipes from the pre-heater to the main boiler and a small length of domestic electrical wiring cable stripped out of its grey sheath became the reverser operating rod. Doing the fiddly pipework is a part of a build that I actually really enjoy and always end up doing more detail than I intended at the start. So the steam pipes to injectors ended up with representations of the control valves made out of fine wire and some old electrical insulation. The original Hornby pipework from the donor was fitted below the cab. Boiler and smokebox handrails were made from a spare Hornby “King” handrail. Safety valves from the donor bodyshell and some nice Bachmann sprung buffers finished off the detailing. The body fixing under the cab was replicated by gently prising out the threaded insert from the donor body and drilling the boss out on the resin kit 4mm. The insert was then very carefully pressed into place, secured with a drop of superglue. The pre-heater parts trimmed up and superglued to the Hornby underboiler/motion support. After a quick test assembly to make sure everything was in the right place the joins were re-inforced on the insides with epoxy resin glue. The final construction involved adding the extra steps under the right hand side of the cab using Evergreen microstrip cemented in an “L” section. Scraps of phosphor bronze sheet became the smokebox steps. Construction completed a good wash in warm soapy water was in order followed by a coat of grey primer. This showed up some porosity in the castings which was filled before the final painting, but that’s why we do the grey primer thing, it not only keys the top coat but it’s great for showing those minor little imperfections. Following a few coats of Satin Black aerosol, numbers, late logos, shed and number plates were added followed by a coat of Matt varnish to seal. Real coal was added to the bunker covering the hole where the drive unit poked through. The loco was completed in about a month and delivered in time for Christmas!